This easiest way to send a reader sound asleep is by being repetitive. Not only by repetitive elements in the story but by grammatical repetition. This is an easy trap to fall into, particularly in dialogue. Even four or five uses of ‘he said or she said’ will be enough to induce reader slumber. A writer needs to have a large toolbox of reporting verbs and be grammatically acrobatic to produce interesting, realistic and flowing dialogue. Think about linking dialogue so even the use of reporting is unnecessary, or at least moving the reporting verb to the beginning from time to time. Another repetition trap is vocabulary that may go unnoticed as you are writing, but will jump off the page to a reader. Look at some of the words you are using and do a ‘Find’ in your document. It can sometimes be a real shock to find out how many times you have use words such as well, dear, then, thing or love. Look also at your descriptive paragraphs. If you are using the past tense and you have ‘was’ six times in one paragraph, it’s a good sign that the paragraph needs re-writing urgently. Another form of repetition is structural. Description, dialogue, description, dialogue without the story moving forward. A story at the same predictable pace will certainly have a reader’s eyelids drooping in a flash. A story needs changes of pace and the unexpected to keep a reader’s interest. A classic example is a chase of some description. A car chase, police chase or a chase on foot through the steamy streets of New York in the middle winter will add pace. The Mini Minor plopping down stone stairs in Rome in ‘The Italian Job‘ was one of the best ideas for a chase I can recall. Think about surprising your reader with sudden changes of pace. Perhaps a tender love scene that heads towards a romantic climax only to be abruptly interrupted by an intruder equipped with a large knife, copious amounts of jealousy and screaming ‘blue murder’ at the top of his voice. But, only do it once. Repeat after me. Only do it once. Many thanks for your excellent posts! Even if we have heard the idea before, to hear it from another slant can be very effective. If you want to streamline your search for repetitive words in your writing, I recommend http://editminion.com. It's an amazing tool another author introduced to me. I'm a big fan of autocrit editing wizard (https://www.autocrit.com/wizardformpage.php) which not only shows you repeated words/phrases, dialog tags, and adverbs, but also gives you a graphic visual representation of your text so you can see the length of your sentences and how they vary. Great advice for good writing. Thanks. I am bookmarking this particular blog entry to help me along the way with my career as writer. Thank you for the wonderful tips and guidelines. I have to say this is all true with story writing, but with poetry it is a completely different story. 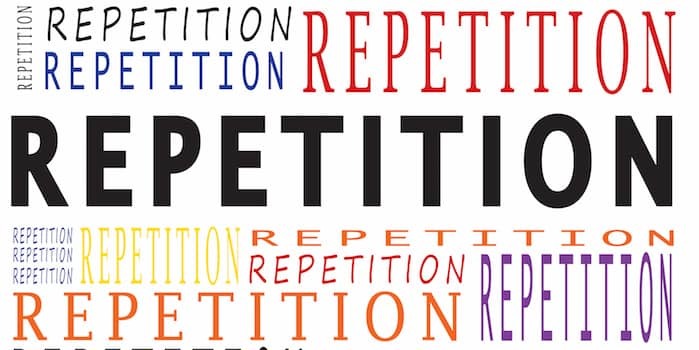 Repetition can be seen as vital in certain aspects and forms of poetry. Sometimes. Let me say this though, I particularly took to heart on this the "only do it once," line. I, as a young writer, tend to be boorish with my work and not move forward. I stick to one style and report too much. So thank you for this wonderful advice, I am going to refer back to this quite a lot. Great point. On a smaller scale, repetition can be funny in humor situations. Also, revisiting something from earlier in a story can have a huge impact on the reader. That being said, the way you've described repetition here should absolutely be avoided.